Minnesota is home to the largest population of Somali and Liberian “refugees” in the nation. They are home to the largest Somali community coined Little Mogadishu who elected Anti-Semite Rep. Ilhan Omar into Congress. When I saw this tweet I thought surely this is a Babylon Bee, NPC Daily or Onion Article he was referencing… I quickly realized it was reality. Minnesota’s local legislators have now succumb to their growing non-American population tweaking laws they put forward to appease the religion of Islam. Governor Waltz also has CAIR’s chapter President on his advisory board and with an AG who is a Sharia Law advocate one would expect no less. I see know exemptions for Christians, Jews or Pastafarians? Current state law bans emailing, texting, and using a web browser while driving. Hornstein’s bill applies the same enforcement and penalties to drivers who do not use their cell phone in a hands-free mode. There are exceptions for emergencies and one-touch activation functions. Sixteen other states and the District of Columbia have hands-free cell phone laws, according to a news release. Personally, laws like this provide a false sense of security and are fear based to condition idiots that don’t practice safe driving to comply. It’s funny how the people subject to these laws can be penalized but law enforcement doesn’t. I am very anti-nanny state laws. Here is the link to the full bill that was introduced on January 14, 2019. On March 25, 2019 it was “tweaked” and the absurd change is highlighted below. 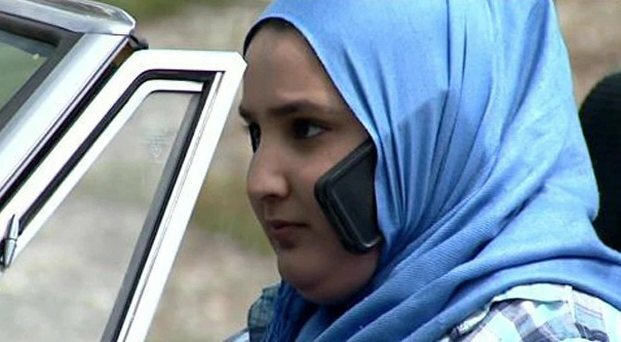 Apparently any item considered clothing that straps a cell phone to your head is considered hands free. Does that mean dialing the number too, answering the phone or just the listening and talking phase? I wonder if this bill covers view obstruction for burka wearers too? I mean you need to have clear sight and vision to drive right? This exemption is silly in an age where most stock vehicles since 2016 come with bluetooth enabled audio systems and some phones are only bluetooth based audio. If you think about it, it’s almost a little racist when examining this law from an extreme liberal point of view. Are they assuming hijab wearers can’t afford newer phones or are they insinuating they only use burner phones? Burner phones are notorious for setting off remote bombs and ISIS recruiting. Can you believe there is a stock image for this? Regardless, this tweak in legislation further reinforces the notion that Minnesota is embracing sharia. They have allowed insane things to happen in their state from Muslim patrol vehicles to insane public exemptions and tailor made laws for one religious group. It’s almost as if they are a protected class. I didn’t know that a religion was a race?